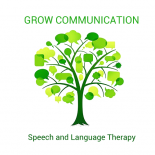 I was trying to articulate to a friend yesterday what kind of a Speech, Language and Communication Therapist I am – and how I approach supporting an individual. I’ve mulled it over some more today – and think the best way to describe me is as a “One size doesn’t fit all” kind of therapist. Then I remembered this farm shape sorter that I got for my girls when they were small. I loved it – my daughter loved me to put the animal shapes in their home slots and she went round and poked them out with her finger as fast as I could put them in – with me feigning annoyance and her laughing her head off. The best way to visualise what “One size doesn’t fit all” means seemed to be using this shape sorter – hey – lets work the analogy to death……. With the basic version (10 slots and 10 shapes) the different pieces naturally fit in different slots. You can cheat and turn a piece on its side and slide it through nearly any of the holes. It’s gone in (end goal reached) but it was about speed not true fit. The smallest shape (the black cat) would sit in most of the slots. But just because it sits there doesn’t make it the right piece. Bigger pieces actually get stuck if you try and force them in the wrong hole. Would take a hammer to get it through and requires a bit of help to undo what has been done there. There are actually an infinite number of slots and no off-the shelf-piece – I often need to carefully and lovingly craft my own pieces. If you want to get it done quickly you can take off the roof and just drop them in. This is the “quick, make it neat and tidy” version. Yes they’re in and no longer all over the floor but they’ve definitely not matched up that way. Every individual’s needs are different – therefore the solution is different (I like to craft the right one). I will keep on hunting for the right pieces – knowing in reality I often need to carefully and lovingly craft my own pieces. This is why I feel a real passion for my work. Because I love to look beyond the 10 part “Communication shape sorter”. 10 parts aren’t bad of course – but the real world has an infinite number. This entry was posted on June 14, 2015 by judephilip in Uncategorized.